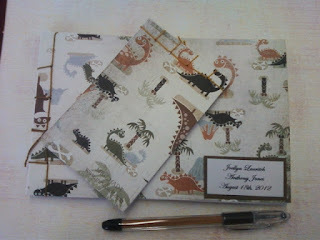 This is a custom dinosaur themed guest book I created for a wedding. I had some left over cover paper, so I created a little notepad for the bride to help keep her organized in those days ahead of the wedding. Inside we used the Guests and Best Wishes pages, so don't let the cover fool you. It's elegant and creative and a whole lot of fun for today!